Any cracks on a bat, no matter where, are not acceptable. The bat will wear out fast, and it won't produce the needed stroke. Also, it will start producing a sort of recoil on the grip when hitting the ball, especially at a pace. You can try if repairing works here. What kind of sea kayak is OK to use in rough waters? Why is Cricket called Cricket? What are the premier Cricket competitions and leagues in the world? 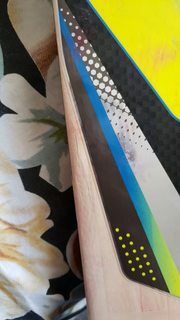 Are roundish cracks on a cricket bat a serious issue?